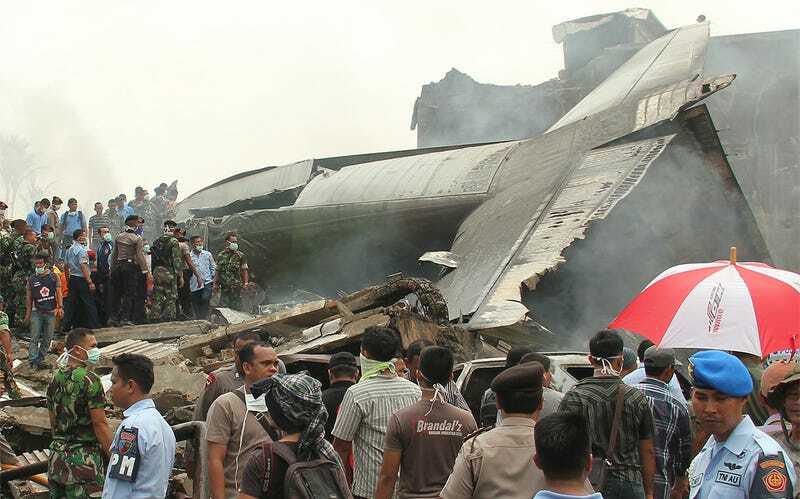 In what is truly a horrific scene, a C-130 belonging to the Indonesian Air Force crashed in a dense residential neighborhood in Indonesia’s third largest city. At this time, reports state that 12 crewman were on-board the Hercules transport, and at least 43 bodies have been recovered from the scene. A frantic search and rescue operation remains underway. The stricken aircraft had reported to the tower that it had to turn back to Soewondo Air Force Base after departing from it moments earlier. The cause of the emergency was supposedly stated as engine trouble. Shortly after that transmission, the aircraft careened into the ground while in a steep right-hand turn back toward the airport. The Indonesian Air Force has a mix of C-130s, with about half the fleet being made up of quite old KC-130B and L-100 models and the other half the fleet being newer, recently refurbished ex-USAF and Australian C-130Hs. Reports vary, but roughly about 20 C-130s are active in the Indonesian Air Force fleet at any given time.